Are you experiencing a sharp, intense, and burning sensation in your chest? Are you afraid that it might be a heart attack? Is your chest pain hampering you from carrying out your daily chores with ease? Relax! Chest pain can differ from person-to-person and the pain and location can also vary. 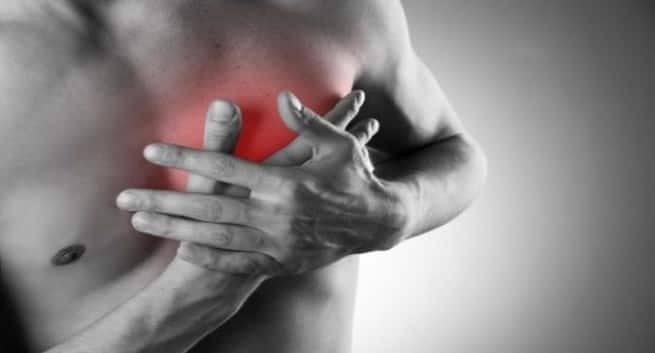 Heart attack, cardiomyopathy (a disease of the heart muscle), bronchitis, acidity, pneumonia, injured or broken ribs and so on can result into chest pain. If you are suffering from chest pain due to heart-related problems you may exhibit symptoms like fatigues, weakness, tightened chest, nausea and abdominal pain. While, you may exhibit symptoms like fever and chills, anxiety, difficulty in swallowing and back pain which radiates towards chest due to other problems. Here are some natural solutions to deal with your chest pain. You can opt for aloe vera juice: It is antioxidant in nature and has antibacterial properties which can reduce your blood pressure, regulate good cholesterol and can be beneficial for your cardiovascular health. Just drink half a cup of aloe vera juice and you are sorted! You should include vitamins in your diet: According to studies, if you suffer from vitamins D and B12 deficiency, you may experience chest pain and can also suffer from myocardial infarction or heart attack. So, see to it that you follow a well-balanced diet. Eat cheese, egg yolk, cereals and soy products. You can opt for turmeric milk: It is rich in curcumin a compound which can help you to reduce your cholesterol and clot formation which can cause heart attack and chest pain. Furthermore, it is also anti-inflammatory in nature and can reduce your chest pain. You can put turmeric in a glass of warm milk and drink it. You can opt for basil leaves: Basil is rich in vitamin K and magnesium. Magnesium can promote your blood flow to the heart and vitamin K can help you to prevent the build-up of cholesterol which is in the walls of your blood vessels this, in turn, can keep chest pain at bay along with cardiac disorders. So, just chew on basil leaves.